Lisa Corrigan. Prison Power: How Prison Influenced the Movement for Black Liberation. Jackson, MS: University Press of Mississippi, 2016. 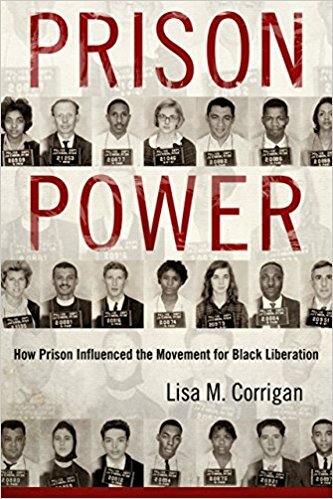 In Prison Power: How Prison Influenced the Movement for Black Liberation, Lisa Corrigan argues that the incarceration of influential Black Power activists like Assata Shakur, H Rap Brown, and Mumia Abu Jamal influenced the shift from the Civil Rights movement to the Black Power Movement. Corrigan’s argument is big: that incarceration affected the Black Freedom Struggle, but her use of three case studies and focus on prison memoir keeps the book from being overwhelming or too detailed. Corrigan also went for well known activists and memoirists, like Mumia, Assata, and H Rap Brown. While these individuals, and their writing, certainly give us insight into the ways prison affected the black freedom struggle writ large, a more thorough engagement with the why of these 3 individuals would have strengthened her argument. While Corrigan gives incredible insights into the relationship between Black Power and incarceration, her argument is limited by her regional assumptions about the nature of both the Black Power movement and civil rights. Though there were chapters of Black Power organizations across the South-in North Carolina, South Carolina, and Louisiana-to name a few, Corrigan reinforces the idea that Black Power was a northern movement that developed out of opposition to the “traditional” Civil Rights Movement. This emphasis erases the activism and intellectual contributions of those Black Power activists located throughout the South. In fact, Corrigan states that “where southern activists were rarely in jail long, given the sentencing guidelines for their relatively minor infractions for civil disobedience, in northern cities black activists were being arrested and imprisoned for long sentences. Also different was the fact that northern groups like the BPP were recruiting from prison.” (45) In this one statement, Corrigan discounts the incarceration of Civil Rights Activists, ignores the long time incarceration of Black Power activists in the South like the Angola 3, and reinforces the dichotomy between non-violent Civil Rights activists and violent Black Power activists. There are certainly instances of activists facing long sentences in the south: what’s more, this statement seemingly discounts the experiences of civil rights activists in places like the Mississippi State Penitentiary. Corrigan’s argument also rests on a distinctive break between the Civil Rights Movement and Black Power, which many scholars of the Black Power movement have been deemphasizing in recent years. Though this might seem like an insignificant historiographical claim, it serves to erase the ways in which prison and prison narrative influenced the non-violent CRM and radicalized incarcerated activists who would be involved in Black Power. This argument also relies on tropes about figures in the traditional CRM, like MLK. That said, Corrigan’s close reading of important Black Power memoirs shows the ways in which, prison, as both a physical and intellectual space, was essential to the development of the Black Freedom Struggle. Almost inadvertently, Corrigan’s work reinforces the ways in which prison was essential to the development of African American intellectual history. The strength of Prison Power is in the close readings of prison autobiographies and the insistence of their significance in intellectual discourse. Furthermore, Corrigan argues that writing is a form of “vernacular protest” within prison. These interdisciplinary readings allow the works of Assata, H Rap Brown and Mumia to be held in a new light. Even still, her central point that “the shift to black power was a significant rhetorical and political intervention into discourse about Civil Rights because of the centrality of the prison and political prisoners” is fundamentally flawed because of its reliance on normative assumptions about the distinction between Black Power and the Civil Rights Movement. Holly Genovese is a S-USIH blogger. Her work has also been featured at Scalawag, Bustle, Book Riot, and elsewhere.